An archival DVD or archival gold DVD is the best option when choosing DVD as a storage format for digital information such as digital photographs, digital videos, and other types of digital files. A picture of two types or archival DVD-Rs. 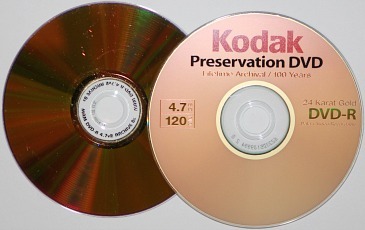 On the left is a 4.7 GB MAM disc and on the right is a 4.7 GB Kodak Preservation DVD. erasable which allows the user to place information on the disc and then erase the information and reuse the disc. Obviously, the read-only format cannot be used to store your own digital files. The DVD -RW or +RW discs can be erased, which is not a great feature for longevity, and tests have shown that the materials used in these discs are not very stable. Therefore, the -RW and +RW formats are not considered archival DVDs. Another type of erasable disc is the DVD-RAM disc, but this format is not in widespread use commercially and little is known about its stability. For this reason, this format is also not considered an archival DVD. That leaves the recordable DVD which comes in three formats: -R, +R, and a dual layer or DL version of the –R or +R formats. Tests have shown that the dual layer versions do not compare well to the single layer versions in terms of stability. For the DVD+R, although similar materials are used and generally similar stability with the DVD-R format exists, many DVD+R discs have compatibility issues. In other words, they do not burn or read well in a wide range of burners or readers. Therefore, the best option for an archival DVD is the recordable disc format. 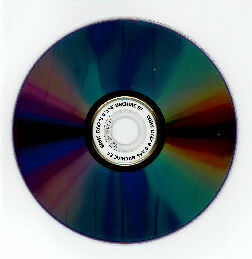 Unlike the CD-R, there is no stable phthalocyanine dye used to store the digital information in recordable DVDs. Instead the dye is similar to an azo or cyanine dye and is usually blue or purple in appearance depending on the dye that is used. The DVD-R dye is less stable than the light green phthalocyanine dye used in archival CD-Rs. The metal reflective layer, which reflects the laser light back to the player’s detector after the dye layer is read in order to create a signal, is usually a silver alloy. Silver alloy is not very stable and can corrode over time. Therefore, to make an archival DVD, a gold metal layer is used as the reflective layer. Gold is inert and will not corrode when exposed to any kind of aggressive elements. Note that the metal layer of a DVD is sandwiched between two 0.6 mm layers of polycarbonate plastic and thus external pollutants would have to migrate through these layers in order to oxidize the metal layer. Therefore, in general, a gold metal reflective layer should not be required because migration of pollutants does not occur readily through the thick plastic. However, the adhesive used in DVD construction can be reactive, and therefore having gold as the reflective layer gives the disc an added element of protection and better longevity and stability. Overall, this archival gold DVD media is not as stable as the gold CD-R primarily because of the less stable dye that is used. 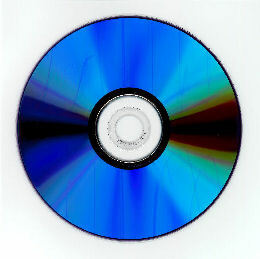 The recordable DVD or DVD-R color when viewed from the base is usually a bright blue or purplish-blue tone when a silver alloy metal layer is present as shown below. When a gold metal layer is present, like in an archival DVD, the disc usually appears like the one shown below. The bluish or purple/bluish color of the disc base becomes somewhat subdued and is not as bright. The largest manufacturer of this type of archival gold DVD is MAM (Mitsui Advanced Media) in the United States. Several other companies in the past, such as Delkin and Kodak, purchased these MAM gold DVDs and rebrand them. The manufacturer of this media advertises that it will last 100 years. Whether this figure is accurate is not really important. What is important is that this type of DVD-R is the most stable available and should be used if an archival type DVD is desired. Falcon is another manufacturer that is currently producing this type of disc. Another type of disc available on the market that is advertised as archival is from Verbatim. This DVD-R has two metal layers – a silver alloy metal layer to reflect the laser light and a gold metal layer as a protective barrier for the more reactive silver metal. Research to evaluate the stability or longevity of this type of disc indicated that is better than the average silver alloy only DVD-R, but not as good as the all gold disc. The testing in this study involved accelerated aging with elevated temperature and relative humidity. The aging environment did not involve the use of pollutants. It is speculated that in a polluted storage environment, this type of silver and gold metal DVD-R will suffer more in terms of stability than the all gold metal layer recordable DVD. A quick summary of DVD-R or DVD+R stability from most stable to least stable is below. Even if an archival DVD is used to store digital files, it is recommended to always have a second copy of the information available on a different type of storage medium. Also, regardless of whether archival media is being used or not, the technologies to read the media eventually become obsolete and the information stored on such media will have to be transferred to another format if the information is to remain readable in the future.